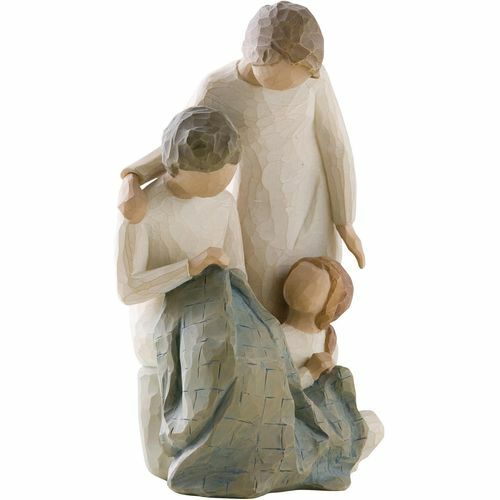 Message on the card inside reads: "Making memories that last lifetimes"
This beautiful Willow Tree figure portrays three generations of women sitting together, sewing a blanket. According to sculptor Susan Lordi, this piece was inspired by her own family - She learned to sew from her Mother, and her Mother learned from her Mother and Aunt. Susan wanted this piece to not only depict the process of learning, sharing and making, but also the creating of memories that are passed down with love through generations. She hopes it resonates with anyone who has lovingly carried on any special tradition within her family.